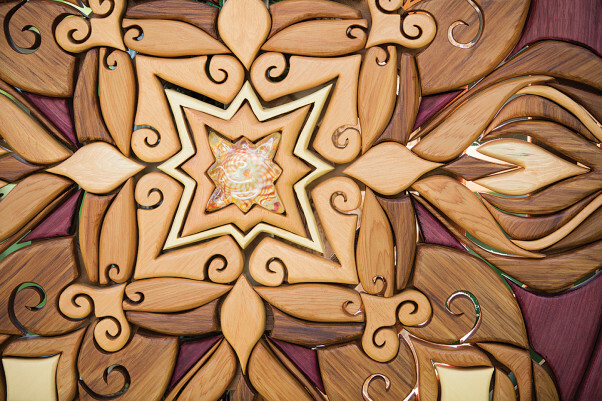 On a cool winter night this past February, more than 400 people showed up to see a unique display of wood art at the Sew Sisters Guild Society in Cumberland. Crowds of happy people came and went throughout the evening and into the early morning hours, enjoying live music, local food and beer inside and around the bonfire, discussing and purchasing unique art made with wood. It was the most successful event the guild had ever hosted. One of the featured artists was Andy Smith, and it was his first ever art show. Most impressive—he’d only started working with wood nine months before. So Smith did some soul searching and attended an indigenous vision ceremony in order to find his way toward a career choice that was appropriate to his personality. Though he was new to woodworking he progressed quickly and started a company called Garden Elf Creations. He was willing to use scrap wood for his own garden pieces, but when friends started ordering them, he knew he needed to bump things up a few notches. Though he is enjoying his bustling new business, Smith is looking at ways to help other artists to share in his success. “Myself and two other wood artists—wood wizards—have started a support network for wood artists called the Wood Vibe Tribe,” Smith says. “It will provide a shared website and shared vending opportunities for festivals and artisan shows. The Wood Vibe Tribe will also act as a resource for other businesses involved with wood, such as builders, craftsmen, ethical wood suppliers and teachers.” Since its inception, the Wood Vibe Tribe has already been featured in two festivals.